This is not an ice cream WITH lemon curd, like most “Lemon Curd Ice Cream” recipes you will encounter on the web. Those are actually heavy cream mixed with lemon curd. For the obsessed Lemon Curd lovers, chances are that you are looking for an ice cream which actually IS Lemon Curd. That’s it, a perfectly balanced ice cream, which fluffs up when churned, does not fill with ice crystals in the freezer and is easily scooped. 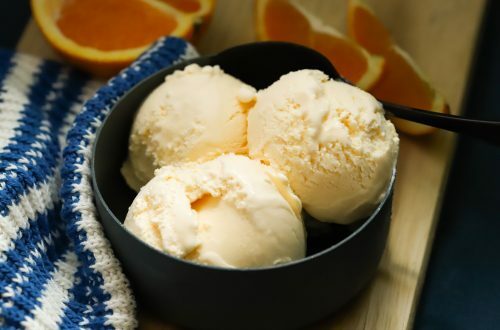 It is a zesty ice cream, bursting with lemon flavour, enriched with egg yolks and mellowed with the addition of butter. You do not have to worry about eating raw eggs in this recipe. With the lemon juice in full boil when poured onto the fridge-cold egg yolks, the whole mix comes to a perfect temperature of 80º C ( 176º F ), which is the exact temperature for pasteurisation. Just do your best and whisk vigorously so that you avoid scrambling the eggs when you add the boiling hot lemon juice. Put the egg yolks in a large bowl, and whisk them lightly to break them down. In a medium saucepan, put the sugar. Zest the lemons directly into it. Add the lemon juice, water, milk powder and salt. Warm over medium heat stirring often with a whisk, until the sugar dissolves. Increase the heat to high.When it comes to a full boil, count 30 seconds. Remove from the heat, and immediately start pouring it in a steady stream into the egg yolks with one hand, while whisking them vigorously with the other. Take great care, as the mixture is scalding, not to let it rise above the your blender’s mark for hot liquids. If necessary, allow the temperature to drop a little. With the blender running, add the melted butter and blend for a full minute. If you have a beamer, you can use this instead. Pour it back into the large bowl. The mixture will be very hot, so stir occasionally to help it cool down a bit. Then place in an ice bath and let cool completely. Stirring always helps it cool down faster. 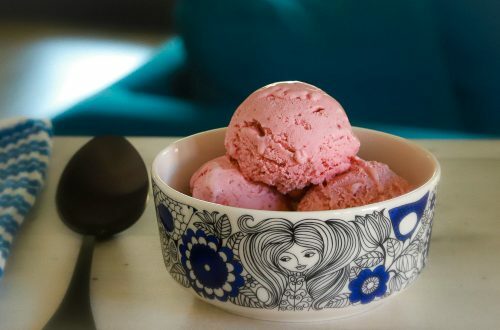 You will need a large bowl, larger than the bowl with the prepared ice cream base. Put in some ice cubes and cold water. Carefully nest the bowl with the ice cream base in it. Pour more cold water from the sides, till it reaches the ice cream base in the inner bowl in height. Take extra care not to spill any water into the ice cream base. 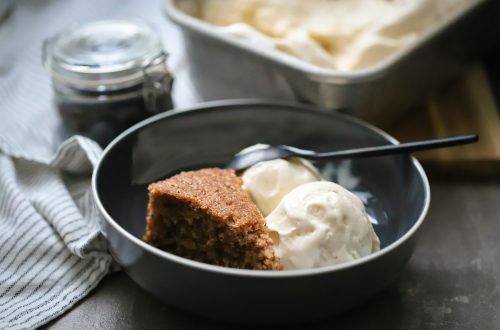 When the ice cream base has cooled, put a mesh strainer over a container and pour the ice cream base through the mesh strainer into the container. Cover with a lid and leave in the refrigerator overnight to cool. Remove the machine from the container and place the container covered with a lid into the freezer. Leave for 3-4 hours for the ice cream to set properly, before serving or removing to another container. This ice cream, like all artisanal ice creams, freezes hard in the long term. To soften it before serving, remove from the freezer and put it in the refrigerator for one hour. Volume measurements cannot be provided for powdered milk, as, depending the type you will use, they vary considerably. Demerara sugar is a variety of raw cane sugar and gives depth of flavour. You may use any kind of raw cane sugar you like, as long as it its light brown in colour. Regular white sugar works well too, although it doesn’t help in building flavour.